The new aviation facility is coming up in the northeast area of the Bahrain International Airport (BIA) in line with directives from Bahrain’s leadership to relocate the airport’s fuel tanks from Arad. Housing three aviation fuel tanks with a capacity of 10,000 cu m each, the fuel farm complex covers 77,000 sq m, in addition to its dedicated operational buildings. It is equipped with state-of-the-art safety and security features and the latest aviation product handling technologies, said the statement from BAC. It will supply aircraft with fuel through 20- and 18-inch pipelines located below the airport runway, it added. The strategic project, an important component of the Airport Modernisation Programme, will reinforce Bahrain’s position as a centre of aviation fuel services in the GCC region and contribute to national economic growth in line with the kingdom’s Vision 2030, said Minister of Transportation and Telecommunications Engineer Kamal bin Ahmed Mohammed during an inspection visit to the site. He was accompanied by Bahrain's Minister of Oil Shaikh Mohammed bin Khalifa bin Ahmed Al Khalifa and other senior government officials. "The fuel farm complex is an important component of plans to restructure the aviation sector in the kingdom and will play a key role in streamlining the aviation fuel supply, operation, and maintenance process at the airport," he remarked. "It is one of the largest infrastructure projects in the Kingdom and is aimed at stimulating sustainable economic growth and diversifying revenue streams in line with Bahrain’s Economic Vision 2030," stated the minister. "There are currently 38 airlines operating out of BIA and we expect this number to grow. The fuel farm, which is being built according to the highest international standards, will enable us to support the increased activity," he added. The ministers were later briefed on the latest milestones of the project, including the achievement of a major milestone of one million man hours without lost-time accidents, in the presence of BAC Jet Fuel Company (BJFCO) board members, and representatives from BAC, engineering consultants Mott Macdonald, and main contractor Amana Pipeline Construction. Shaikh Mohammed praised Noga’s vision to support pioneering projects aimed at achieving a number of tangible and qualitative goals, including improving efficiency and the expansion of aviation fuel operations and services. He also stressed the importance of completing the construction of the complex of aircraft fuel depots in a timely manner in accordance with the highest specifications and standards, and utilising the highest level of skill, knowledge and competency. 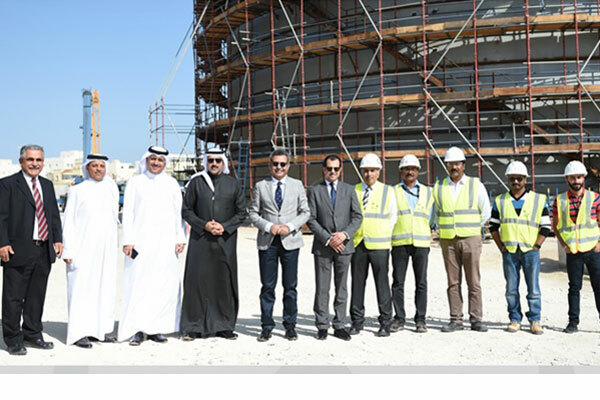 Following the tour of the site, BJFCO chairman Engineer Abdul Majeed Al Qassab gave an update on the project’s progress and the details of upcoming stages. On completion, BJFCO will be responsible for the facility’s management and operation, as per directives from Bahrain’s leadership. "The objectives of the restructuring are to create a more competitive environment in the aviation fuel sector and to meet the needs of airlines more effectively," remarked Kamal bin Ahmed.